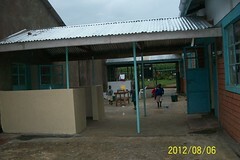 Continuing updates from Trip 19 to Child Redeemed Mission Home (Formerly SOH). Cool Story of God’s perfect timing….Of course the water well failed and we have no water! It was Saturday morning, Memorial Day weekend back in the US. We were leaving in 3 days. It had been rainy and cloudy so we expected less water from the solar powered well pump…but there was none. It was also by chance that we discovered it because we just shifted a large amount of water to the community tank for distribution expecting the well pump to replenish the tank and had we not done that, a few days would have gone by. Greg and I are the two people in the world with most intimate knowledge of the water system at SOH. It has to be something simple we said…no way a major failure happens on the 2 weeks we happen to be in Uganda on an unplanned surprise visit. Community members getting clean drinking water from the CRM well. We began diagnosing and eliminating possible causes. We switched the system from DC Solar to AC Generator….of course after needing to spend several hours repairing the generator, bad gas, broken fuel line, broken starter rope. No pumping. We waited for the sun to shine and see if the DC Solar would work. Nothing. No error on the controller that would indicate a bad wire or controller. Voltage was present at the pump wires. Must be the pump. This won’t be fixed until Monday at the earliest…nothing to do but conserve water and pray for rain. It did rain which gave us enough water to make it till Monday. The phone numbers we had for the NGO, Water Missions, provider of technical service and parts was not being answered and no one was working in the US. We decided to drive 100 km to Jinja and go to the Water Mission office and hope to speak with a guard that has phone numbers. We did that, the guard recognized me, and he helpfully began the process which ultimately resulted in a technician coming out Monday morning with a pump. Eight of us pulled all 265’ of PVC pipe, wire, and pump up out of the well, finding the pump is OK but the wire is not. We think a lightning strike on Friday (it was really close) burned out the wire enough to prevent the motor from working but left enough so the controller would not show an error. Now where do we get 300’ of specialty wire? We brought it with us! We planned a project to run wire for security lights at the Chicken Coop, bringing 600’ of quality shielded wire, graciously provided by Charlotte Wire, but did not have time to do it. Tasking that wire for this repair and reinstalling the pump, had us back in the clean water business in a few hours. The flag on top of the tank is a homemade full indicator we installed. Too many cases of perfect timing and provisions for random luck. Thank you God!